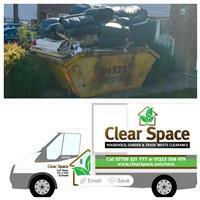 Clear Space - Rubbish/Waste/Clearance based in Eastbourne, East Sussex. Formed in 2016 Clear Space solutions aims to provide you with cost effective clearance of your household and trade waste materials. Clear Space owner Darrin Connor worked at Plant Movements Ltd for 16 Years as a Project Manager (CPCS/CSCS Appointed Person/Lifting Supervisor) and managed major projects all over the country within the construction industry. These projects involved the lifting, transportation and installation of mechanical and electrical plant and equipment - and the removal of redundant plant. Prior to this Darrin worked for Plant Handling Services as slinger/signaller for 11 years. He has a total of 27 years’ experience in the sector. Darrins son Steven Connor joined the company in October 2017 a valued member of staff.